Whether you’re on-site or want to manage your flares remotely, Steffes offers flare control options to help maximize efficiency and ensure your flares remain lit. The Steffes Flare Controller is an innovative system that provides dependable flare monitoring to maximize performance on your site. Its easy-to-read LED display provides flare pilot temperature and indicates operation status with a simple green light to indicate the pilot is operating properly and red light to indicate the pilot needs attention. With its smart ignition system and its ability to connect to the flare’s data logger, you can keep records to prove consistent performance. 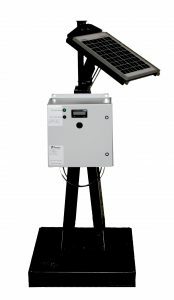 The Steffes Flare Controller is powered by a 360 degree rotating solar panel and rechargeable battery. The Steffes Flare Pilot Monitor is perfect for retrofitting sites to meet regulation requirements. With its dependable temperature display, easy-to-read operation status indicator and rechargeable battery, the Steffes Flare Pilot Monitor is a simple solution to help save costs on your site.